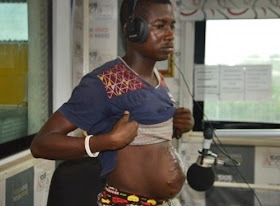 Home Health Surgery Leaves Young Man With "Pregnancy"
Surgery Leaves Young Man With "Pregnancy"
A 22-year-old man identified as Harrison Gbisanya, has been left with a bloated stomach after undergoing an operation at Ridge Hospital. What happened? According to online reports, Gbisanya had the surgery on January 13, at the hospital in Accra, Ghana, after he was referred there from the Maamobi polyclinic to the 37 Military Hospital and then to Ridge Hospital. Speaking while narrating his ordeal in an interview with Chief Jerry Forson on Ghana Yensom on Accra 100.5 FM on Tuesday, June 12, he revealed that he went to the hospital because he had stomach ache. Harrison's health condition soon became controversial as people keep trooping in and out of the hospital which made the hospital transfer him to Greater Accra Regional Hospital. He said that after the nurses took his vitals in the hospital, the doctors told him he needed to undergo a surgery, and after successfully going through the process, Gbisanya said he started feeling pains in the part of his stomach where the surgery was conducted. “I was admitted that night and the doctor who actually carried out the surgery came the following morning and saw my condition and gave me other prescriptions. He gave me injections on my stomach and discharged me”, he revealed. He revealed further that the situation has worsened since he left the hospital. He therefore appealed to the general public to assist him, as he has no money to go for another treatment.